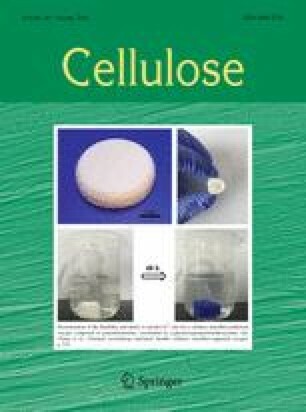 Cellulose spheres were selected as an economical and biodegradable carrier for urease immobilization. The high crystallinity cellulose spheres (Ces) were crosslinked using citric acid and then oxidized using sodium periodate to produce aldehyde groups on the Ces surface that would bind covalently with the amino groups of urease through a Schiff base reaction. Ces, the obtained dialdehyde cellulose spheres (DACes) and cellulose spheres immobilized by urease (UrCes) were characterized by FTIR, XRD, SEM and TG. The results demonstrated the successful modification of Ces and immobilization of urease, along with the retention of the original spherical morphology and improved thermal stability. As an adsorbent, UrCes had both a greater adsorption capacity for urea and a greater specific selective adsorption than DACes. Urease was respectively immobilized on DACes with 19, 31 and 45% aldehyde contents to obtain UrCes1, UrCes2 and UrCes3. The maximum removal capacities of UrCes1, UrCes2, and UrCes3 for urea were 243.3, 276.2, and 187.6 mg g−1, while only 10.71, 15.08 and 20.50 mg g−1 l-phenylalanine were adsorbed, respectively. This research was supported by the National Nature Science Foundation of China (51462009 and 51662011).